Item # 288016 Stash Points: 4,995 (?) This is the number of points you get in The Zumiez Stash for purchasing this item. Stash points are redeemable for exclusive rewards only available to Zumiez Stash members. To redeem your points check out the rewards catalog on thestash.zumiez.com. 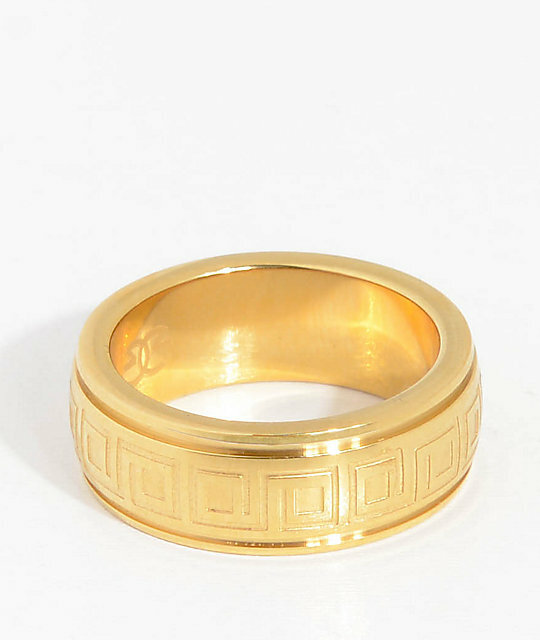 Finish off your look with the Barroco ring from The Gold Gods. A shiny gold ring is embellished with a continuous box engraved design. A perfect way to make your hands a part of any outfit. Barroco Gold Ring from The Gold Gods. 1cm wide x .2cm thick. Includes black velour drawstring carrying bag.